USO Mondeville failed in breaking their EuroLeague Women record of gaining three consecutive victories by losing on the road to Galatasaray MP. For the first time in their ELW history Famila Schio made it four wins in a row by beating Arras. Bourges Basket saved the honour of France this week with a victory against Tarsus Belediye. In Group A, Rivas Ecópolis had to reschedule their match for 12:30 in the morning because of national strike actions in Spain. Their opponents Uni Györ were literally asleep during the first quarter and paid the price with a 16-point first-quarter deficit (8-24). Györ finally woke up in the second quarter. For six minutes they dominated the match to trail by 2 points (28-30). However this was as close as they got to troubling their hosts. Rivas Ecópolis won the match (84-65) for their second EuroLeague Women victory of the season. Anna Cruz filled the stat sheet with 19 points, 2 assists and 4 steals for the hosts. Ziomara Morrison chipped in 15 points and Queralt Casas was on hand for 13 points. In the rest of Group A action, Bourges Basket won on the road against Tarsus Belediye (65-61) with the help of solid free-throw shooting. However the real story of the night belonged to Zoi Dimitrakou (in picture) who was playing her last match for Bourges Basket. She travelled to Turkey on a one-way ticket with all her belongings because as luck would have it she had signed for Turkish club Kayseri KASK. Dimitrakou signed off from Bourges with 10 points. 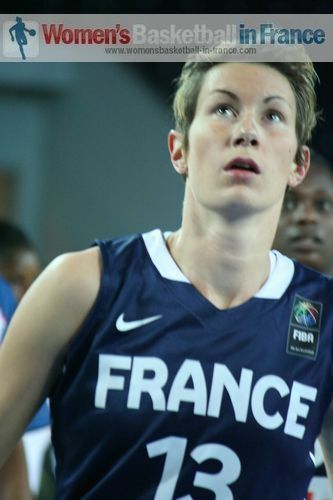 Frida Eldebrink was the leading scorer with 18 points while Nwal-Endéné Miyem and Emméline Ndongue also finished in double digits with 15 and 10 points respectively. Sparta&K M. R. Vidnoje more or less rested their first team with none of the established starters playing more than 16 minutes as they powered past BK IMOS Brno (95-63). At the moment Arras are struggling to score points. So they need to play well defensively for the full 40 minutes, which again was not the case. A poor third quarter in which they dropped their guard against Famila Schio sealed their fate as they went on to lose the game (49-74). For Famila Schio French international Elodin Godin (in picture) had a complete game scoring 10 points while adding 10 rebounds, 5 blocks, 5 assists and 5 steals. Her team mate Jantel Lavender top scored with 20 points. For Arras Dawn Evans was the leading scorer with 14 points. In the other two games from EuroLeague Women Group B, there was plenty of suspense. Fenerbahçe SK were all over the place and can count themselves lucky to beat Uniqa EuroLeasing Sopron (77-71). They picked themselves up in the final quarter with some classic play by Polish international Agnieszka Bibrzycka who connected three times from beyond the arc in a final-quarter flourish (28-15) . So far any match with Nadezhda-Orenburg has been fun to watch. But it has been tough on their coach Aleksander Kovalev who had to follow their latest ELW match from hospital where he is treated for thrombosis in his right leg. Municipal Targoviste held on to beat Nadezhda-Orenburg (79-76) in a dramatic finish. USO Mondeville played well for 20 minutes and led at half time (31-26). The second 20 minutes were not so good and they ended up losing on the road (47-58) to Galatasaray MP. Ann Wauters and Lindsay Whalen with 15 points each and Saziye Ivegin (8 rebounds) with 10 points carried Galatasaray to victory. 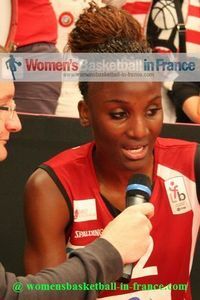 Laëtitia Kamba (in picture) had a double-double of 10 points and 10 rebounds for USO Mondeville, while Naignouma Coulibaly picked up 18 rebounds and scored 9 points. In the FIBA TV game of the week ZVVZ USK Prague opened their EuroLeague Women win account with a road victory against Novi Zagreb (79-71). ZVVZ were never in any difficulty despite the closeness of the final score. 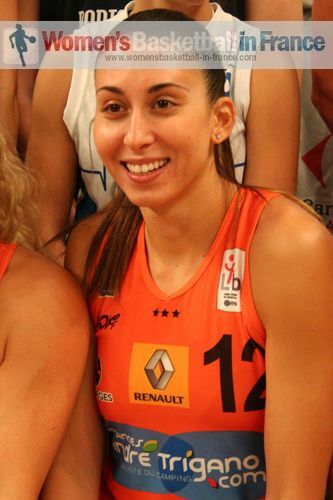 Jelena Dubljevic had 21 points for ZVVZ while Mirna Mazic put in 24 points for the hosts Novi Zagreb. UMMC Ekaterinburg were not brilliant but a 22-7 second-quarter run was all they needed to keep CCC Polkowice at bay to win (66-57) on their home court. Candace Parker had 16 points and 14 rebounds for UMMC. For CCC Nneka Oguwumike was the leading scorer with 17 points.